Something feels different about Kaiser Slots in comparison to many of the other new online casinos that have been released in 2017, but it’s hard to put a finger on why. It isn’t that this site has a particularly unique style or design, but there’s something about the fun-loving tone here that one can’t help but find charming. For a brand-new site, standing out is vital, and Kaiser Slots seems to be capable of doing that, which is a good start. There is an increasing number of online casinos which opt to focus primarily on slots, not only in their content, but also in their name. it’s understandable, with the rapidly growing popularity of slot games, but it feels like an odd choice to neglect players who prefer other game types. As with many other similarly named online casinos (and there are many of them) Kaiser Slots actually does offer a variety of other game types, and players are probably getting used to this often being true. However, one can’t help but feel that there will still be lovers of Blackjack, for example, who will assume that a site called Kaiser Slots is not the place for them to play. This doesn’t have to be the biggest of problems though, Kaiser Slots wouldn’t be the first online casino with Slots (or Spins) in its title to find success, but does it have what it takes? Kaiser Clots offers a wide range of game types, and they clearly want to make sure players know that, because navigation is incredibly simple here, with main categories at the top of the page, and sub-categories further down making everything easy to find. The design itself combines the subtle and the noisy impressively, with the logo and predominantly white background balancing out the excitable dog mascot and brightly coloured design touches that feature throughout the Kaiser Slots site. Artwork from popular games at the site is also utilised, including in the top banner which promotes the welcome bonus and in thumbnails throughout the homepage which allow one-click access to many of the titles that Kaiser Slots has to offer players (predominantly slots, unsurprisingly) again allowing for simple navigation for new visitors and existing customers alike. 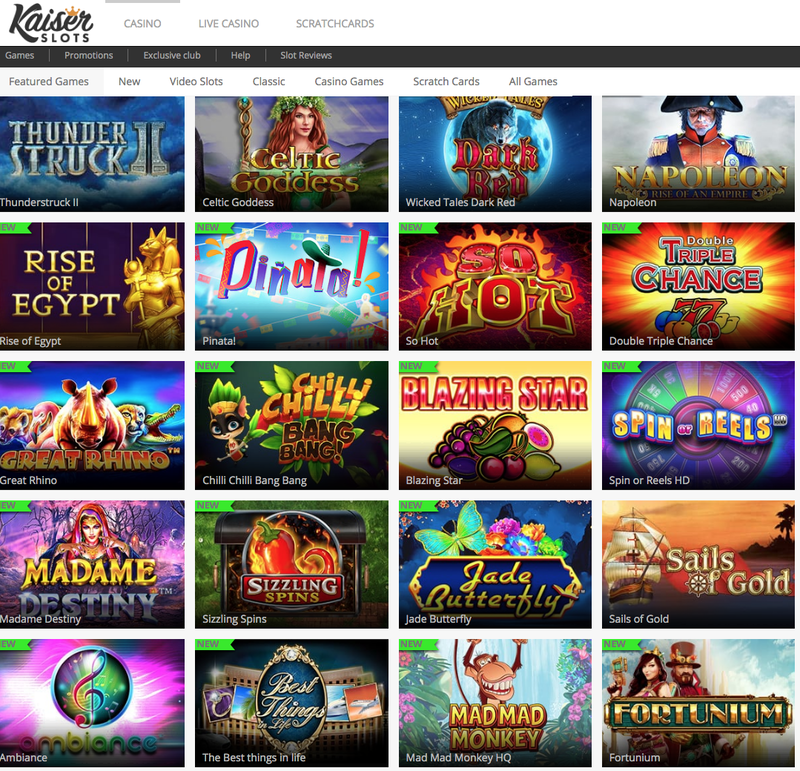 There’s isn’t anything particularly special about the way the Kaiser Slots site looks, it’s more that the execution of a simple theme is so impressive, that it stands out from the crowd. This Tau Gaming site has a wide range of games on offer from some of the biggest names in software development, as well as a few upstarts who are looking to make their name. The games provided come from an impressive list that includes Blueprint Gaming, ELK Studios, Evolution, Microgaming, NetEnt, NextGen Gaming, NeoGames, NYX Gaming, Play'n GO, Realistic Games, SG Gaming, Stars Group, and Williams Interactive, so there really is something for everybody here. It isn’t only in developer that there’s variety either. Obviously, slots are the focus, and you will find new releases including CopyCats, Mermaid’s Diamonds, and Viking Runecraft here, joined by a plethora of classic games. However, outside of the slots selection you will find an array of table and card games, including an impressive live casino (courtesy of Evolution Gaming), as well as scratchcard games for the instant win fan, and more besides, there is no base that is not covered by the games available at Kaiser Slots. This is a site that seems to be attempting to find success by simply being consistently excellent, and it’s doing a great job of it so far!